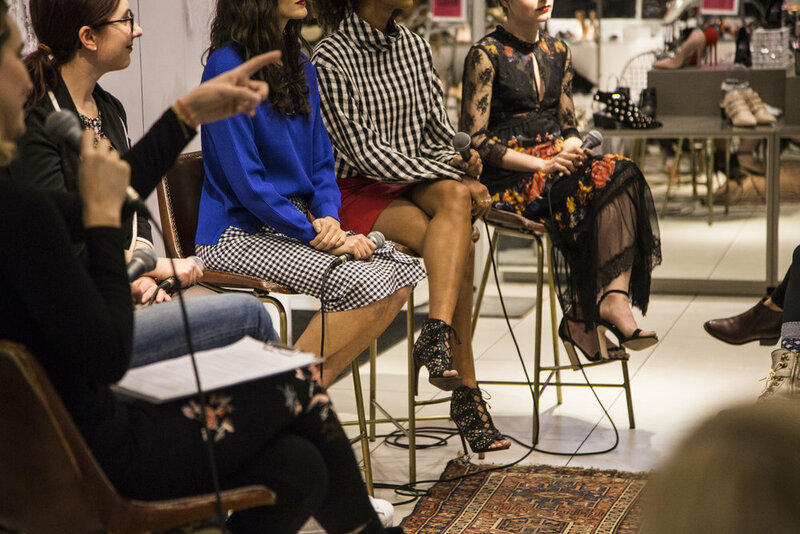 There may have been a baby blizzard outside, but our Work + Wellness pop-up at Topshop in Soho was still packed with panelists, audience members, knowledge, and some fab outfits thanks to Topshop Personal Shopper. We took it to the audience at times-- asking who felt burnt out, who had cried in the last week, and despite decreased visibility outside, inside the store it was very clear: we all felt the same way-- a little burnt out by the 24/7 nature of work and life, the tech tear, and that no one can do it alone. Here are six of our favorite takeaways from last night. But know that means different things to different people. Nicole Loher, who works a full time job, trains for triathlons and is a wellness influencer, says that she is constantly taking small steps to get it right, but echoes the idea that ‘right’ and ‘well’ are subjective— a word that host, model, and dancer Ally Love brought up. Case in point: the morning of our panel Nicole woke up at 4am to train with her swim coach. “Every day is a work in progress for everyone,” she shared. “Burn out is real,” shared Nicole, piggybacking on that idea. “Don’t be afraid to ask for help.” “Find what you love to do in your full time job and try to make sure that your full time and part time job can merge,” explained the wellness influencer who in her full time job likewise manages influencers in the wellness space. Keeping up with the web and social is a struggle for everyone— from the most seasoned influencers, to those who appear to have their content game on lock, to the women on panel. "Your success level is not established by how active you are, but how productive you are." “For people who are working weekends and nights and feel like there is an expectation that they put in a lot of time— there probably is that,” said Rebecca Willa Davis, Deputy Editor for Well + Good. “But I also think that even in our downtime we are taxing our systems. We’re watching Netflix while we’re on our phones, while we’re eating dinner, while our friend is sitting next to us,” she said. “We're not fully embracing our downtime." It other words: unplug, get outside, and pay attention to the friend sitting next to you. Rebecca shared that she typically sets aside nights and weekends to get emails out, but even though that schedule works for her, it wasn’t the healthiest for her team. Do we need to turn up or turn off?